The birth of the Pirate Party as a political actor is proceeding in full view of the public. But it is too early to know whether the infant will live and prosper, or whether it will be a stillborn child. The formation and rise of new political actors within a representative democratic system is necessarily a chaotic process marked by internal contradictions. In Europe, the best example is the recent rise of the Pirate Party in several countries, and especially in Germany. The German party is an interesting case (from which Pirate politicians in other countries should draw several lessons) because it succeeded in attracting public interest before it even constituted itself as a proper political party, and because it scored political victories before voters had fully formed an impression of the party’s potential and its role within the multi-party system. The true birth of the Pirate Party as a political actor is proceeding in full view of the public. It is still too early to determine whether the infant will live and prosper, whether it will be a stillborn child, or whether the birth will spawn two radically different twins. Most European parties emerged to represent the interests of a certain clientele, of a social group, whose members had clearly identifiable shared characteristics, which they themselves regarded as shared and important, and from which they derived interests that had to be articulated and defended in the political arena. Such parties were the voice of a social class that would otherwise have remained silent. Workers’ parties represented – at least ideally – the interests of the working class. Conservative and liberal parties also represented, at least to a significant degree, the interests of a clearly defined social group. It would be misleading to argue that such shared concerns, which give rise to the desire for group representation, are increasingly rare. The rise of a new political party can be a clear sign that the formation of a new political class has gone unnoticed, and is now breaking into mainstream politics, and that the members of that group increasingly see themselves situated in a particular social situation, recognize others in similar social situations, and identify them as fellow members of the group. 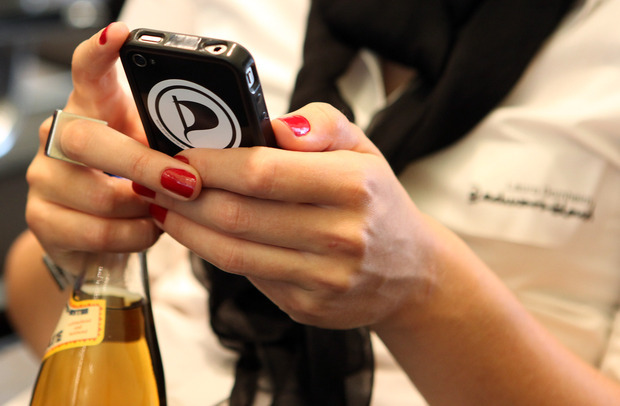 In the case of the Pirate Party, commonalities arise not only in relation to certain leisurely activities or to certain gadgets and fashion styles. The shared characteristic is a close connection to technologies that can be compared in its intensity and its significance to the connection between the factory worker and mechanized production at the end of the 19th century. But let us first draw a methodological distinction between Pirates and the Pirate party, just as we would draw a distinction between workers and workers’ parties. Without drawing up a detailed sociological profile, we might still postulate that Pirates are as intimately familiar with internet technologies as industrial workers were familiar with the steam engines or with power looms on the factory floor. Pirates program the websites we use, they establish the framework for the presentation of information, they fill new knowledge databases with content. All the while, they are growing more conscious of their own social importance. They also regard themselves as marginalized – as individuals, and as members of a social class. This feeling of isolation isn’t overcome just because a few Pirate representatives are now playing minor roles in the political theater. To the contrary: the reception of their representatives as members of the political class has only highlighted the differences between Pirates and the rest of society. The social exclusion of the digital working class is evident. It largely arises from the uprootedness of the individual from a region, a city, a physical environment. A Pirate’s home isn’t the harbor but the ocean, we might say metaphorically, and this is precisely what separates him from those who dwell on land, whose home is a city, and whose social circle is defined by the people with whom they interact in person on a regular basis. By contrast, Pirates sail to different shores, they are linked to each other across vast distances. Distance doesn’t equal separation for the Pirates as they surf across currents and waves. Such a remote world will inevitably give rise to new forms of exchange and new property rights that might appear as foreign and dangerous to land dwellers as they seem natural and useful to the Pirates. The difference in their lived existences is the source of political conflict between the new class and the rest of society, and the conflict is only strengthened by the recognition of both parties that society has become increasingly dependent on the work of this new social class. But democratic society is well prepared for a situation like this. The new class can form a party to represent its interests, it can hold party congresses, it can elect steering committees, it vote on rules of procedure and candidates for office, and its elected representatives can ensure that the interests of their constituents are recognized and respected. So what’s the problem? And why do the rank and file – those who form the living and breathing foundation of the Pirate Party – become more frustrated as the party grows as a legitimate political actor? The answer isn’t hard to find: the Pirates’ agenda isn’t limited to demands for copyright reform and calls for an unconditional basic income that would ensure a minimum standard of living for the content providers of the internet. The agenda includes a much more radical claim about the future organization of society. The rise of the Pirate Party highlights an important conceptual distinction: most political interests can be pursued through established channels and procedures. But some interests seek to undo and reinvent the procedures themselves. The current misunderstanding stems from the attempt to do both under the same name, and to have the same people working on both projects. But it should be evident that it is impossible to pursue interests within the framework of existing organizational structures, and simultaneously offer a radical critique of these structures for the 21st century. For the party to prosper it would be necessary to separate the representation of Pirates’ interests (as a social class) from the project of democratic renewal. Connections and sympathies run across this conceptual demarcation, of course, and they might even inform each other if the separation is upheld. But mixing the representative and the radical projects together only creates viscous goo that threatens to suffocate the activists, that will first harden and then crumble, not leaving any trace of the party’s former dynamism.